The 2012 World Day of Prayer service took place at Salvation Army, Cedarbrae Chapel on Friday, March 2. The participating churches from the neighbourhood were Holy Trinity Armenian Church, St. John the Divine Anglican, St. Ninian’s Anglican and St. Stephen’s Presbyterian Church. 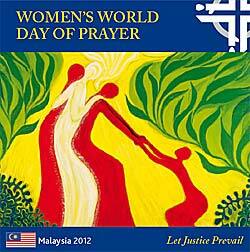 This year the service was prepared by the women of Malaysia and the theme was “ Let Justice Prevail”. Virginia Misakyan, Sossy Barounian and Nora Baltayan participated in the service, representing our church. Following the service, there was a fellowship hour when refreshments and sweets were enjoyed by everyone. World Day of Prayer is a worldwide movement of Christian women of many traditions who come together to observe a common day of prayer each year on the first Friday of March. This annual event is facilitated by the World Day of Prayer International Committee and takes place in 170 countries and regions in the world, and across Canada, 2000 communities observe it. The funds collected from the offerings received during WDP services across Canada are used to provide grants for various worthwhile projects in Africa, Asia and Latin America. Next year the World Day of prayer will be hosted by Holy Trinity Armenian Church.